Organizations overseas have been ascending and prosperous with eminent platform of Salesforce applications. Esteemed individuals with superb knowledge on the Salesforce- related tools play a crucial and significant role in ruling the business operations. Everything (Sales, marketing, HR, Customer Service, etc.) in a firm now is improvised with Salesforce – demanding the workforce to finish the tasks through inculcating Salesforce knowledge and skills. Therefore, there are wide choices for Salesforce job aspirants to get into its excellent career. Many candidates are even drawn to it because Salesforce is associated with – better career, better salary, offersfrom big multinational companies, better job opportunities, and worldwide operation of Salesforce. However, better chances are presented to the candidates who are well-talented, trained and certified, with preferable hands-on experience on Salesforce. With the growing demand for Salesforce professionals, you are lucky to enter into the great ambience in various companies. But, are you interested to know how to grab Salesforce jobs? Then, you are at the right point. Salesforce training and certification is highly beneficial for one to enter and maintain stability in the esteemed career. Various concepts of Salesforce are explained with practical sessions and real-time projects through Salesforce online training overseas. As per the industry needs and certification basis, the course content and modules are planned and developed. The Salesforce certifications are more valuable – they are supposed to enhance your preference in career development. The credentials increase your marketability in the IT market. Companies assure faster deployments upon assistance with certified specialists. Better deliverables from the companies make customers to understand that the project handling team is well-experienced with certified Salesforce experts. Each and every specified role of Salesforce has its peculiar and important characteristics. However, the roles and responsibilities vary as per the hierarchy and complexity. It is pertained for all the positions – may it be developer, administrator, consultant or manager. However, make sure that the learning process should be made continuous to sustain and progress professionally. What to Choose in Salesforce Career? Now that you have decided to develop your Salesforce career path, you are here reading this article. But, the question “Where to go? What to choose?” comes to the mind immediately.Though the query seems to be critical, the instinctive reply is simple and lies within you – your own capabilities and characteristics encase the ability to pursue the right path of Salesforce. However, the decision can be drawn in two steps – first is to understand the roles and responsibilities of the job designation, and the second is matching your qualities with those obligations. Now, let’s know certain details about the Salesforce jobs and their responsibilities. Salesforce administrator is one of the most demanding jobs today – it is the key role in administering the Salesforce services for the company. 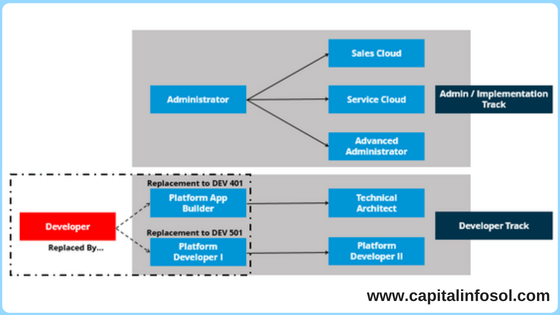 Here are some responsibilities of Salesforce administrator. A Salesforce administrator is engaged to improve business values, deal with stakeholders, business partners and customers, and maintain healthy relationships with vendors. However, the responsibilities of the administrator are crucial and important, and vary with hierarchy levels, complexity and users. 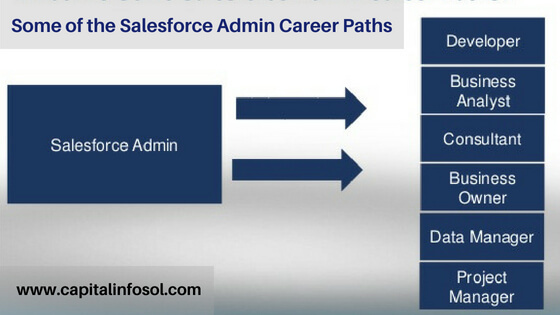 Great knowledge of Salesforce CRM and platform are prerequisites for the Salesforce administrator. As you got an idea on the role of the Salesforce Administrator, you should know the personal qualities to be possessed and suitable for it. So, if you have any of the above qualities, then you can choosecareer for the Salesforce CRM/Administrator. Salesforce developers tend to operate in the background of the platform – able to develop validations accurately. The career of Salesforce development for one who is perfect in coding and interested in in-depth and logical thinking for addressing the project development. The main role of this position is to provide efficient working of the Salesforce eco-system. 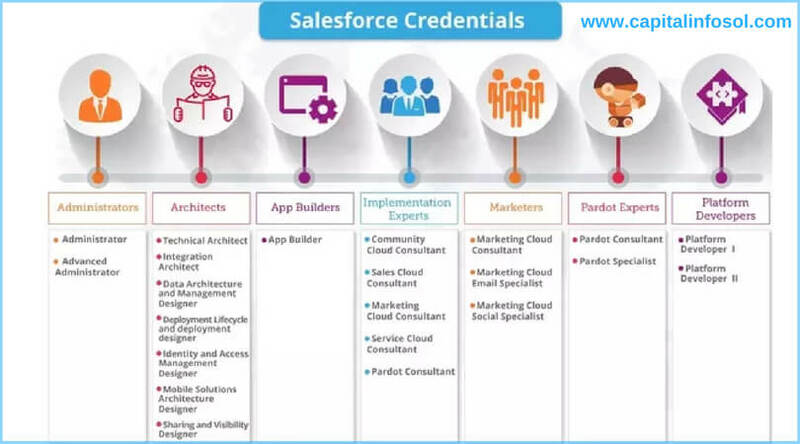 Integration of the Salesforce to the business system, its smooth operations and changes, scalability, data load, and solutions for current and future trends of the Salesforce, are the effective duties of the Salesforce Technical Architect.Go through some of the duties the architect performs. If you are great in problem-solving and broad thinker, then you can choose this role. However, it’s essential for one to inculcate great knowledge on various aspects of Salesforce. Following the requirements of customers and clients, the Salesforce Sales Cloud consultant designs solutions to optimize the Sales functions. People having experience as a senior business analyst are preferable for this position. It is necessary to be certified as a Salesforce Administrator to become a Salesforce Sales Cloud Consultant. Similar to the above one, best experienced senior business analysts are preferable for this position. However, they are involved in designing the solutions for Service Cloud functions of Salesforce. The person opting for this position should be highly brilliant in solving business-related problems. Salesforce App Builder is an important role indulging innovation and development of apps – it is done through lightning techniques. 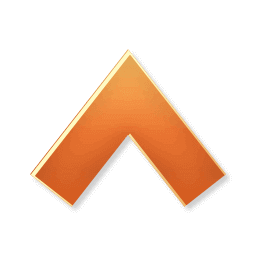 With rise in mobile businesses, there has been a prominent rise in demand of the App builders in many organizations. Creativity, expressive vision, and ingenious resourcefulness make one to flourish as successful Salesforce App Builder. With respect to the concern on improving marketing strategies, the Salesforce Marketing Consultant is engaged to gather client and market information through Salesforce Market Cloud service. Perfect business solutions, development of optimized business processes, management of customized marketing strategies are a few duty charges of the marketing consultant. Key business insights upon data analysis are provided by a Salesforce Business Analyst. Distinctive solutions and elucidations, and recommended business responsive actions are given by the person holding this position. In fact, the best experience in Salesforce help one to sustain as the Salesforce business analyst. If you are effective in helping customer success, then you can opt Salesforce Sales Manager. The sales manager is engaged to maintain and manage multiple deals, progress the sales processes, and help to overcome obstacles. However, excellent communication skills, sales perspectives, and experience in sales management are essential for one to get into this role. A broad perspective of Salesforce technologies and a zeal to adapt continuous learning make anyone to enter Salesforce path and settle with attractive package and professional recognition. So, get charged to pertain Salesforce training in Hyderabad–derive desirable certification –achieve the desirable Salesforce job from manifold options over the globe.